One of the most popular and delicious savoury snack, Fried Poha Chevdo / Chivda is super tasty and tongue tickling and not so complicated to prepare. 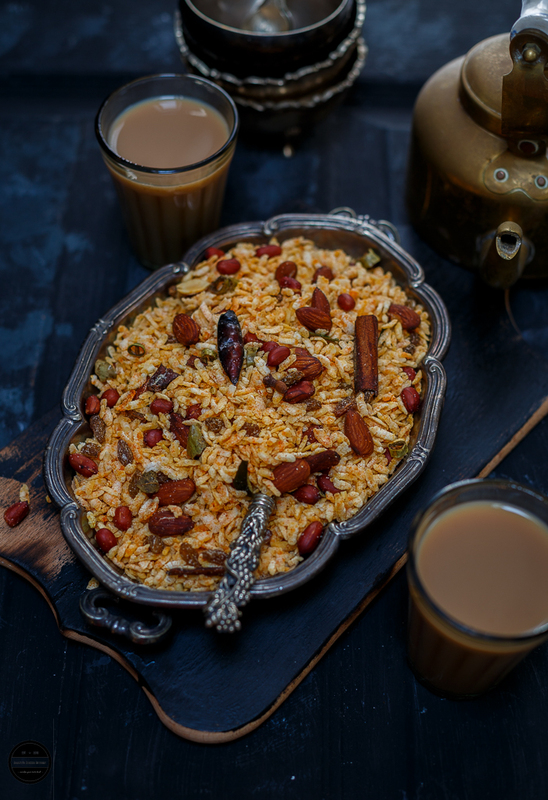 This crunchy and aromatic chevdo is prepared with thick flattened or beaten rice (Poha), assorted nuts and tossed in basic spices. Generally, chevdo is prepared during the festivals such as Diwali or Holi, many consume throughout the year too. Mother's is day approaching very fast for us Brits, it's on 11th of March. It is the day of the year when we all want to try our best to make our mum feel special, we all want to find a perfect gift for our mothers to express our love and appreciation. It's natural for one to get emotional around this time of the year whose mother is no more in this world, what can we do? I and my husband have lost our mothers a few years back, and their departures left a vacuum in our lives, pain still lingers and since then our lives have never been the same but they always stay alive in our hearts and in our memories. When a child is unhappy about something, he goes to his Mum. But in my case the story was little different, we were hesitant to approach our Mum with any problem as she seemed a strict teacher and was known as 'Iron Lady' by friends and neighbours rather than a humble mum. My mum was the strongest pillar of our family. I was raised by a mother who was hardworking, strong and powerful, she always carried herself with a strong attitude. she was outspoken, fearless and stubborn at the same time. But with all these strong points there were some weaknesses as well she was short-tempered and took many decisions on impulse and because of her thoughts and opinions she suffered some losses along the way. She believed in working hard, she refused to take rest throughout her life. For her 24 hours in a day were not enough because I knew she always wished for and given the best to us and there are many examples I can share but then the post will go longer and longer, so today being a food blogger, my memories that I will cherish about my mum are through the food medium. So now you are thinking that My mum was a great cook? and maybe that is why I inherited her cooking skills? Nope, although mum was strong and modern thinking, she was so simple, and definitely wasn't a great cook. She never cooked anything fancy but only simple everyday dishes. Whatever she cooked, always healthy with minimal exotic spices, oil, ghee or sugar. Only these ingredients were used liberally on the occasion of Diwali, Holi or on our Birthdays. I always loved whatever she cooked, but Poha Chevdo / Chivda is my favourite all time of dish of hers. She cooked Poha Chivdo only once in a year, on Diwali. Many times on a previous night of Diwali she would work till 2am and prepare Diwali delicacies. Nothing special is added in this Poha Chevdo of hers, not any rich or expensive nuts or spices yet that poha chevdo tasted amazing, everything was so well balanced in there, just the right spiciness, right sweetness and right sourness. I always tried making a chevdo, just like hers. In the beginning I just could not do it but after so many trials and errors I achieved that result and that was just a few years back, so I thought of giving this recipe a warm place on my blog here :) and take a great pride because I have never inherited her 'Iron Lady' image but at least I have made Poha Chivda exactly like my mum. Poha Chevdo / Chivda can be made with two types of Poha, thick or thin, for deep fried Chevdo you must use thick Poha, my mum always used thick poha. In my mum's recipe, she never added any fancy ingredients such as cashew, almonds, raisins, cinnamon or cloves, but I have put a cinnamon stick, raisins and a few almonds for the photographic purpose only. This recipe can be changed a little according to your taste, you can increase or decrease spiciness of this dish or add any other nuts too. 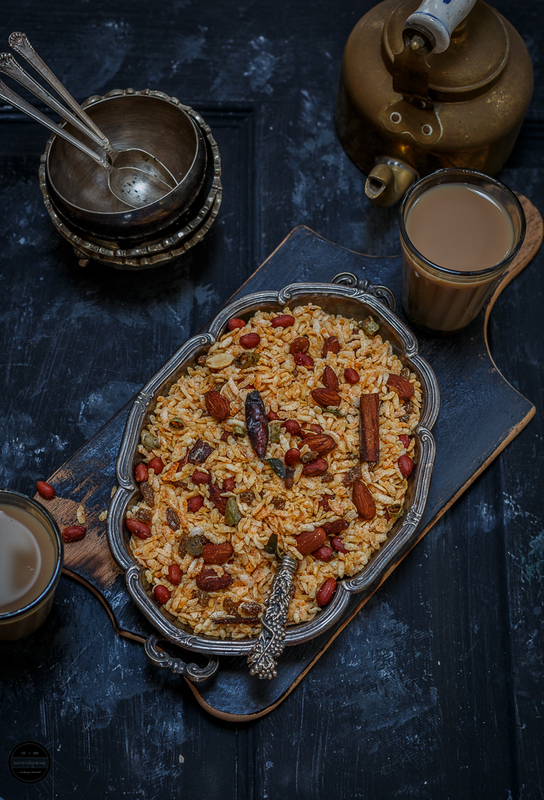 Poha Chevdo is a popular savoury snack that is prepared with beaten rice, nuts, and basic spices. First clean the poha properly. In a one bowl mix both red chilli powder, salt, turmeric powder, sugar and citric powder and keep it aside.Heat oil in a kadai on medium heat and fry poha using a big sieve. Don't add all the poha at once.Remove the fried poha in a big plate.Now fry peanuts, then lower the heat and fry green chillies and curry leaves.Mix everything in a big plate and add the spice mix little by little into the fried poha mix while the mixture is still warm.Once you achieved the right taste and colour of the chevdo, stop adding the spice mixture.Gently keep mixing the poha chevdo for a while so all the flavours reaches through fried poha. Let the poha chevdo cool completely. Once it cooled store in an airtight container.Serve with a cup of masala chai, juices or on its own.Enjoy! Mum's are the best n the holes they leave when they go is never filled. I am sure your mum guided you as you tried the chivda. Looks yum. I can't make a decent chivda in my life. This one is my favourite.. and so addictive. I used to make at home in large quantity when I living in Lagos as we never got anything Indian in the market. I love Chiwda. They go so well with a cup of masala chai. Your shots are gorgeous. 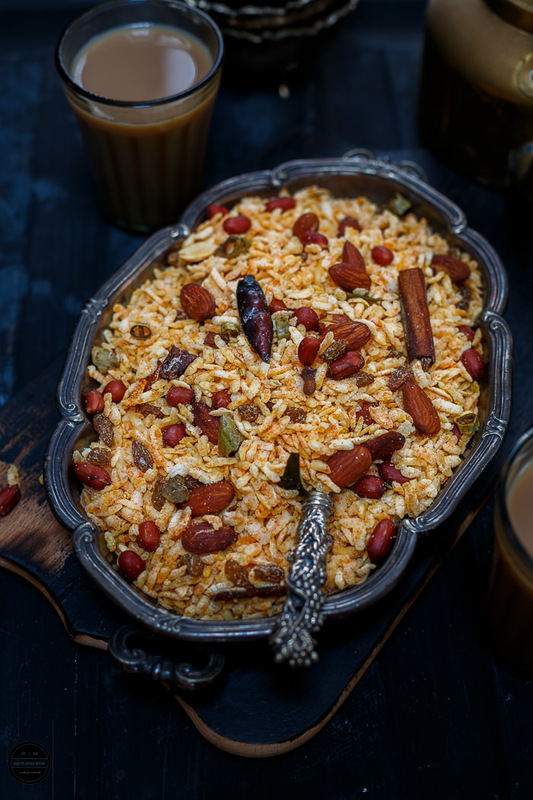 If i make this poha chevdo, i wont keep myself away from them, dangerously addictive they are, a prefect evening snack to munch with a cup of masala chai. Thanks Jags for adding my chiwda link dear. I loved reading your post Jagruti. So emotional and a perfect dedication for Mothers day. This snack is so addictive and can't my eyes off my your gorgeous and tempting clicks ! I remember trying this poha chevdo at a friend's house. It looks totally irresistible and I am in love with that rustic teapot. Crispy Poha is a very good friend for us for any time of the day and it saves us on unexpected guest visit. Amazing clicks as usual. Tum ek normal chewda Ko bhi itna fancy banana hi lete ho. Chiwda is our favourite.. this poha chiwda is instant and easy to make..
Moms are always the best. So glad to know about your mom.Looking at this chivda i feel so nostalgic.It brought back so many wonderful memories of my childhood when this roasted chivda was a regular evening snack at my place. Your photography makes it look more stunning. Poha Chivda is so addictive. that too with chai make me hungry now.. Love your pic composition.. I love the sweet and tangy taste of this chevdo. I hope you have made enough to share. :) I love recipes that bring back childhood memories. Firstly got very emotional reading about your mom. You need such strong pillars only then you grow stronger and wiser as you grow older and learn a lot from the mistakes. Not to forget, makes you extremely mature suddenly. More power to strong independent girls like us. Your moms recipe rocks and you have beautifully styled and photographed it. My Mom always believed in eating fried snacks as well as having a healthy lifestyle. I on the other hand tend to get lazy with the exercise schedule. This is addictive snack, love binging with tea. Mothers are special and this is a nice tribute to your mom Jagruti. Very beautifully written post Jagruthi! I always feel the dishes made by mom is simple with minimal ingredients yet they taste out of the world and is the best comfort food! This chivdo looks like a great snack for kids. Love this snack, especially when it's mom's recipe. Even if they cook with simple ingredients, they turned to be the yummiest dish. loved reading about your mom. Even my mom never cooked fancy stuff,very simple. But that time we loved that too.Moreoevr kids expectation was also not like today's :P.
Coming to the recipe preapared this chivda so atsefully. I put all those ingredients which you added for photograph. Will make one soon. Your Poha chevda looks delicious with so many nuts added to it. I think our mums used the most natural products and served it with lots of love and that's why whatever they made was good.